"Lola Lolay of Bahay na Bato"
IF INTERNET’S SOCIAL MEDIA were already existing during the Philippine-American War, and somebody had posted the famous picture of the aged Doña Teodora Alonso next to the excavated skull of the national hero, there might have been an online pandemonium which could have surpassed the Gangnam Style’s record. Some consider the picture morbid, but others regard it as an indubitable manifestation of the mother’s intense love for her son. Doña Teodora Alonzo y Quintos is the homemaker of the first massive stone house, or ‘bahay na bato’, in Calamba,which is the very birthplace of the national hero. It was a rectangular two-storey building, built of adobe stones and solid woods, with sliding capiz windows. Its ground floor was made of lime and stone, the second floor of hard woods, except for the roof, which was of red tiles. There was an azotea and a water reservoir at the back. The courtyard contained tropical fruit trees, poultry yard, a carriage house, and a stable for the ponies. Its architectural style and proximity to the church implied the owners’ wealth and political influence. Rizal’s ancestral house was destroyed during World War II. Juan Nakpil supervised its reconstruction and restoration as ordered by President Quirino. With funds mainly contributed by Filipino school children, this Jose Rizal Shrine was inaugurated in 1950. It is said that the only surviving feature of Rizal’s original house is the deep well that has become a ‘wishing well’ for many tourists. Even the house’s familiar white color was not preserved for it was repainted a pale shade of green. Nonetheless, many Rizal ‘relics’, including the supposed black coat worn by Rizal during his execution, can be found in the shrine. Unknown to many, Doña Teodora—together with her husband—is buried near the narra tree about 20 meters away from the shrine’s ‘wishing well.’ For long, this historic Calamba house was tended and managed by Jose’s mother also known as ‘Lolay’. Common biographies state that Doña Teodora Alonso Quintos Realonda was born on November 8, 1826 in Santa Cruz, Manila and baptized in Santa Cruz Church. Strangely however, the volume in the church books that supposedly contains Teodora’s baptismal records is the only one missing in the otherwise complete records down to the eighteenth century (Ocampo, p. 39). Asuncion Rizal-Lopez Bantug, the granddaughter of Jose’s sister Narcisa, distinctively claims that Lola Lolay and her all siblings were born in Calamba, but (just) lived in Manila (Bantug, p. 18). Doña Lolay was educated at the College of Santa Rosa, an esteemed school for girls in Manila. She was usually described asa diligent business-minded woman, very graceful but courageous, well-mannered, religious, and well-read. Very dignified, she disliked gossip and vulgar conversation. Possessing refined culture and literary talents,she influenced her children to love the arts, literature, and music. Herself an educated woman, Lolay sent her children to colleges in Manila. To help in the economy of the family, she ran sugar and flourmills and a small store in their home, selling home-made ham, sausages, jams, jellies, and others. Looking back, her business in a way predated the meat processing commerce of the Pampangueños today and the ube jam production of some nuns in Baguio. Lolay’s great-grandfather was Eugenio Ursua (of Japanese descent) who married a Filipina named Benigna. Regina, their daughter, married a Filipino-Chinese lawyer of Pangasinan, Manuel de Quintos. Lorenzo Alberto Alonso, a well-off Spanish-Filipino mestizo of Biñan, took as his ‘significant other’ Brigida Quintos, daughter of Manuel and Regina Quintos. The Lorenzo-Brigida union produced five children, the second of them was Jose Rizal’s mother, Teodora Alonso Quintos. Through the Claveria degree of 1849 which changed the Filipino native surnames, the Alonsos adopted the surname Realonda. Rizal’s mother thus became Teodora Alonso Quintos Realonda. Doña Teodora played an important role in the life of the national hero. She was said to have suffered the greatest pain during the delivery of her seventh child, the younger of her two sons, Jose. Her daughter Narcisa recalled: “I was nine years of age when my mother gave birth to Jose. I recall it vividly because my mother suffered great pain. She labored for a long time. Her pain was later attributed to the fact that Jose’s head was bigger than normal” (Bantug and Ventura). But this would not be the only pain that she would suffer on account of this son. Lolay was the first teacher of the hero—teaching him Spanish, correcting his composed poems, and coaching him in rhetoric. On her lap, Jose learned the alphabet and Catholic prayers at the age of three, and had learned to read and write at age 5. At an early age, Rizal thus learned to read the Spanish family Bible, which he would refer to later in his writings. Rizal himself remarked that perhaps the education he received since his earliest infancy was what has shaped his habits. The mother also induced Jose to love the arts, literature, and the classics. Before he was eight years old, he had written a drama which was performed at a local festival and for which the municipal captain rewarded him with two pesos. To impart essential lessons in life, Lolay held regular storytelling sessions with the young Rizal. Doña Teodora loved to read to Pepe stories from the book ‘Amigo de los Niños’ (The Children’s Friend). One day, she scolded his son for making drawings on the pages of the story book. To teach the value of obedience to one’s parents, she afterward read him a story in it. Lolay chose the story about a daughter moth who was warned by her mother against going too near a lamp flame. Though the young moth promised to comply, she later succumbed to the pull of the light’s mysterious charm, believing that nothing bad would happen if she would approach it with caution. The moth then flew close to the flame. Feeling comforting warmth at first, she drew closer and closer, bit by bit, until she flew too close enough to the flame and perished. Incidentally, Pepe was watching a similar incident while he was listening to the storytelling. Like a live enactment, a moth was fluttering too near to the flame of the oil lamp on their table. Not merely acting out, it did fall dead as a consequence. Both moths in the two tales paid the price of getting near to the fatal light. Doña Teodora was remarkably against the idea of sending Jose to Manila to study, arguing that he already knew enough and that “if he learns more, he will only end up on the scaffold” (Bantug, p. 37). This stand she reiterated when Rizal had to go to the University of Santo Tomas for higher studies. Aware that Spanish officials frowned at learned Filipino, shetold her husband: “Don’t send him to Manila again; he knows enough. If he gets to know more, the Spaniards will cut off his head” (as quoted in Zaide, p. 46). Doña Teodora never ceased to worry about his bright son. In 1884, after Rizal gave a toasting speech in Spain at the banquet for the winning Filipino painters (Juan Luna and Felix Resurreccion Hidalgo), his assail to the unworthy Spaniards in the Philippines received a great deal of reactions. The general sentiment was that it would not be good for him to return to the Philippines. This caused Doña Teodora much worries that she turned ill. Upon recovering, she begged his son through a letter not to meddle in things that bring her sorrow, and to comply instead with the duties of a good Christian. 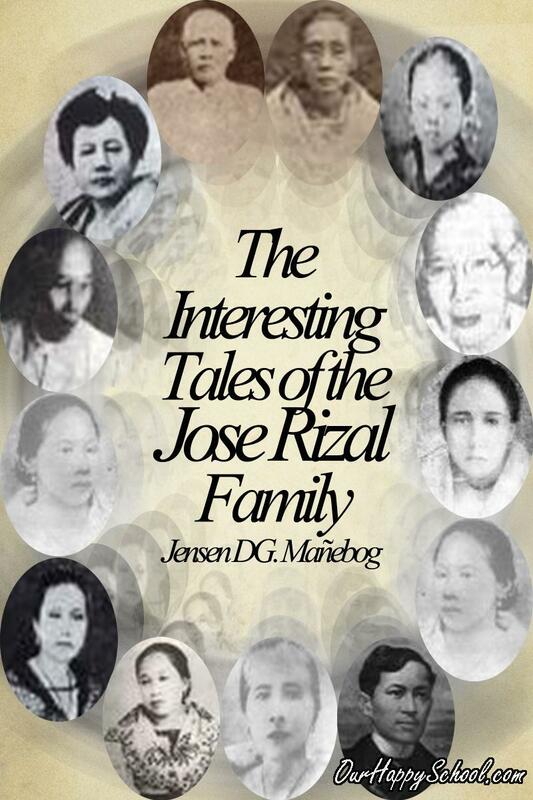 Among Teodora’s siblings—Narcisa, Teodora, Gregorio, Manuel, and Jose—it was the youngest, Jose Alberto, who became the most historically significant to the Rizal family. Jose Alberto, the illustrious engineer of Biñan, studied in a British school in Calcutta, India. It is said that he exerted a good influence on the young Rizal, particularly inspiring him to cultivate his artistic talents. Jose Alberto is diversely referred to as brother, cousin, half-brother, or stepbrother of Teodora Alonso, depending on the biographer you are reading. This is now clarified by the unearthed information that even before Lorenzo Alberto Alonso (Teodora and Jose Alberto’s father) took Brigida as his better half, he “had married a 12-year old Ilocana named Paula Florentino in 1814” (Ocampo, 2013, p. 38). Those who declare that Jose Alberto is Teodora’s half-brother thus seem to imply that Jose Alberto was from the Florentino lineage and therefore the only legal son of Lorenzo Alberto. However, a document written by Rizal himself, now being kept at the Rizal Library in Ateneo de Manila University, plainly reveals that Jose Alberto and Teodora Alonzo are of the same parents. Moreover, Lorenzo Alberto Alonso’s marriage to the 12-year old girl from Vigan—which was by a fixed marriage—did not produce any child. Dr. Bimbo Sta. Maria, an officer of Biñan-based organization, United Artists for Cultural Conservation and Development (UACCD) believes that the half-brother issue was part of the family’s plan to keep its ties with the Spanish government (“Mga Lihim ng Pamilya ni Rizal”). Researching about Rizal’s family for many years, Sta. Maria had known that Lorenzo Alberto was conferred the title “Knight of the Order of Queen Isabella the Catholic” for supporting the Dominicans in their missions in Indo-China. The title was transferable to one of his legal children after his death. However, all his children by Brigida Quintos (including Teodora Alonzo and Jose Alberto) were all illegitimate in papers. To receive the influential title, Jose Alberto, with the approval of his siblings, thus declared himself the legitimate son of Lorenzo Alberto and Paula Florentino, in effect disowning his real mother. If Sta. Maria’s theory is correct, then the controversial 200-year old mansion in Biñan should at least be considered by the government as a historical landmark for being the ancestral house of Teodora Alonso’s family. As of this writing, the mansion is being demolished for plans of making the place commercial. When Rizal was just about to go to Manila to continue his education at the Ateneo, an ordeal occurred to his family—his mother was thrown into prison. Jose Alberto, Lolay’s ‘favorite’ brother, had returned from Europe and found that her wife, Teodora Formoso,left their home and children for another man. He planned to divorce her, but Doña Teodora persuaded the couple to reconcile so as to avoid family scandal. Alberto’s wife however sued her husband for allegedly trying to poison her and incriminated Dona Teodora as his co-conspirator. Alberto’s wife was aided by the Spanish lieutenant of the Guardia Civil. Remarkably, the Calamba’s gobernadorcillo, Antonio Vivencio del Rosario, was hasty to believe the charge. The two officials were frequent guests at the Rizal home but both had been nursing grudges against the Rizals. At one occasion, Rizal’s father could not accommodate to give fodder for the lieutenant’s horse. The gobernadorcillo, on the other hand, is said to have felt insulted that he had not been shown any greater respect than the Filipino guests in his visits to Rizal home. Barbara Cruz-Gonzalez, great granddaughter of Rizal’s sister, Maria, shared one detailed version of the ‘poisoning’ accusation based on the tales that circulate in the involved clans (“Mga Lihim ng Pamilya Ni Rizal”). She narrated that Jose Alberto, upon discovering his wife’s infidelity, locked Teodora Formoso in a room in the historically controversial mansion in Biñan, and asked her sister Teodora to watch over his wife. One day, Teodora Alonso brought some food to Formoso which the latter refused to eat. Formoso instead fed it to her dog. Allegedly, the dog eventually died after eating the food. Hence, with the help of a leader of the Guardia Civil, who was purportedly Formoso’s lover, Jose Alberto’s wife had sent Teodora Alonso to prison. Rizal’s mother was imprisoned in Santa Cruz, the capital of Laguna. It is said that the Rizals appealed to the Supreme Court, which ordered her immediate discharge. But she was rearrested by the order of the insulted judge, stating that Rizals’ appeal to the Supreme Court was contempt of his court. The Supreme Court irrationally upheld this contention. Some other fabricated charges were filed against her, hence she languished behind bars for about two and a half years in the 1870s. In both imprisonments, Rizal’s mother was forced to walk rough roads before being locked up in the prison cell in Santa Cruz, Laguna. When she was incarcerated for the first time, some histories claim that she did a gruesome 50-kilometer walk, while others state ‘16 kilometers’. So why is there a discrepancy? Which figure is plausible? Online distance calculators today indicate that Calamba is 43-kilometer away from Santa Cruz, suggesting that the ‘50 kilometers’ claim is more plausible. But that is if the walk was really from Calamba to Santa Cruz. Because a relative of Teodora Alonso,Jacoba Faustina-Cruz, narrated that the forced walk was only from Biñan to Calamba (as quoted by Ocampo, 2010, Philippine Daily Inquirer). Thus, if Cruz’s statement is true, then the ’16 kilometers’ claim is more reasonable. Biñan and Calamba are 15.2465035627 kilometers away from each other, according to a modern mobile phone’s application. Concerning the second time Teodora was imprisoned, Rizal’s descendants claim that the then half-blind Teodora Alonso was ordered to walk ‘85 kilometers’ from Manila to Santa Cruz (Bantug, p. 100). Modern distance calculators suggest that 91.5 kilometers is the distance between the two locations, though it’s only 58.9813974616 kilometers if one could just fly like a bird in a staight line. The Zaides’ however claimed that the walk was only from Calamba to Santa Cruz (Zaide & Zaide p. 205)—which if true, then the walk was just about a half shorter. Either way, the miserable experience of Doña Teodora had predated the sufferings of the victims in the infamous WW II Death March (about 151 kms.). 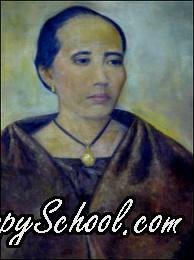 One known thing about Rizal is that he loved his mother very much. At the end of his first year at the Ateneo, Rizal visited her mother in Santa Cruz prison without telling his father. Doña Teodorajoyfully embraced her son who told her of his outstanding school grades. The next summer vacation, Rizal did not forget to see again and brighten up her mother with news of his academic successes. On her part, Doña Teodora had mentioned of her dream the previous night. Rizal interpreted the dream as portending that she would be released from prison in three month’s time. Rizal’s ‘prophecy’ proved true as Teodora was set free barely three months after her son’s visit. The most known poem written by Rizal in Ateneo, ‘Mi Primera Inspiracion’ (My First Inspiration) was dedicated to his mother on her birthday. It is believed to have been written in the year 1874, upon the release from prison of his mother. Upon learning that Doña Teodorawas going blind, Rizal decided to take medicineat the University of Santo Tomas. He nonetheless transferred to the Universidad Central de Madrid where he obtained the degree of Licentiate in Medicine. And because he really wanted to cure his mother's advancing blindness, Rizal went to the University of Paris and then the University of Heidelberg to complete further study in ophthalmology. After earning the fury of the Spaniards in the Philippines for writing the Noli, Rizal decided to return to Calamba in 1887 despite his loved ones’ strong warnings. His major reason for standing by his decision is to perform an operation on Doña Teodora’s eyes. Newly released from prison in 1891, Doña Teodorajoined Rizal in Hong Kong where the Rizal family had a happy Yuletide celebration together. And when Rizal was exiled in Dapitan, Doña Teodora did not hesitate to leave the peaceful life in Hong Kong in August 1893 just to keep house for her son. The son operated on his mother’s cataract in Dapitan. The whole ophthalmic treatment was successful despite her being a difficult patient, removing at least once the bandages from her eyes against her son’s prescription. In 1895, Doña Teodora left Dapitan for Manila to be with Don Francisco who was getting weaker. Attesting to his mother’s being a loving wife, Rizal wrote in his letter to Blumentritt: “My father is well again and my old mother does not want to separate from him – like two friends in the last hours of farewell, knowing that they are going to separate, they do not like to be far from each other.” In October 1895, Rizal sent her mother his now widely acclaimed poem ‘Mi Retiro’ which he wrote upon her request. After Doña Lolay left Dapitan, Josephine Bracken came to Rizal’s life. The son wrote her mother about Josephine. Aware that the priests refused to marry the couple, Doña Teodora told her excommunicated son that loving each other in God’s grace was better than being married in mortal sin (Bantug, p. 120). In 1896, when the revolution broke out while Rizal was on his way to Cuba, he wrote to his mother these meaningful sentences: “Don’t worry about anything; we are all in the hands of the Divine Providence. Not all who go to Cuba die, and when finally one has to die, at least one may die doing some good” (as quoted in Bantug, p. 136). When Rizal was sentenced to death after a mock trial, the aged Doña Teodora fervently plead to the governor general for her son’s life, but to no avail. In Rizal’s last hours, his sorrowful mother came to see her sentenced son. Teodora Alonso was not permitted a last embrace by the guard though her beloved son, in quiet grief, managed to press a kiss on her hand. Captain Rafael Dominguez, the special Judge Advocate appointed to institute the court’s action against Rizal, was said to have been moved with compassion at the sight of Rizal’s kneeling before his mother and asking pardon. What greater grief could dwell in a mother’s heart than to see the day come when her dearly loved son would be executed just for wishing the best for his family and country. On December 30, 1896, Doña Teodora indeed tragically lost her much-loved son. More than ten years after, the Philippine government offered her a lifetime pension as a sign of gratefulness. With sincere dignity, she refused the offer, courteously explaining that her family had never been patriotic for money. She suggested that if the government had plenty of funds, it better reduce the citizens’ taxes. Try our SEARCH ENGINE (upper right section) for your RESEARCH and other interesting entries.